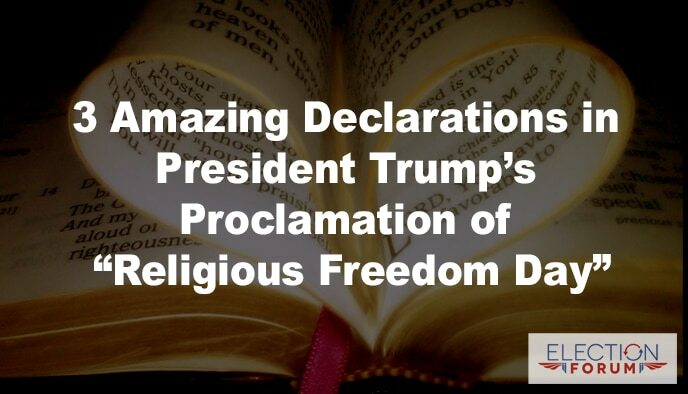 This is the opening line of President Trump’s proclamation of January 16, 2018 as Religious Freedom Day. Religious Freedom Day commemorates – among other things – the passing of the Virginia Statute of Religious Freedom on January 16, 1786. The statute was written by Thomas Jefferson. 1. Recognition of our religious history. Often forgotten in today’s top-down centralized government approach to dealing with domestic issues is the belief by our founders that freedom is not a right granted by government … it’s a sacred right bestowed by God alone. President Trump emphasizes this fact in the text of his proclamation. This principle of freedom being above the purview of government formed the basis of the First Amendment to the U.S. Constitution. 2. Hope for freedom of conscience for those being persecuted in America for their faith. President Trump points out that our constitution and laws guarantee Americans not only the right to believe as they see fit, but to freely exercise their faith. President Trump has addressed these injustices with an Executive Order. 3. Hope for the persecuted church around the world. President Trump believes that freedom of conscience is not just for Americans. The entire proclamation is worth reading. Click here to read it on the whitehouse.gov website.